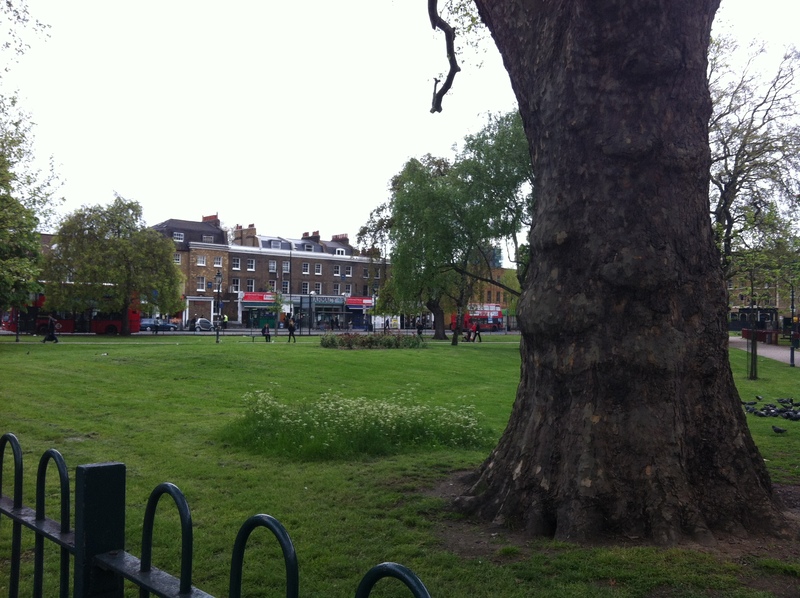 All over London this summer, I’ve noticed wildflower and grassy meadows where before there was regularly mown grass. This is something I’ve been persuading landlords to do for the last year and a half, and now, suddenly, it seems to have become part of the general zeitgeist. 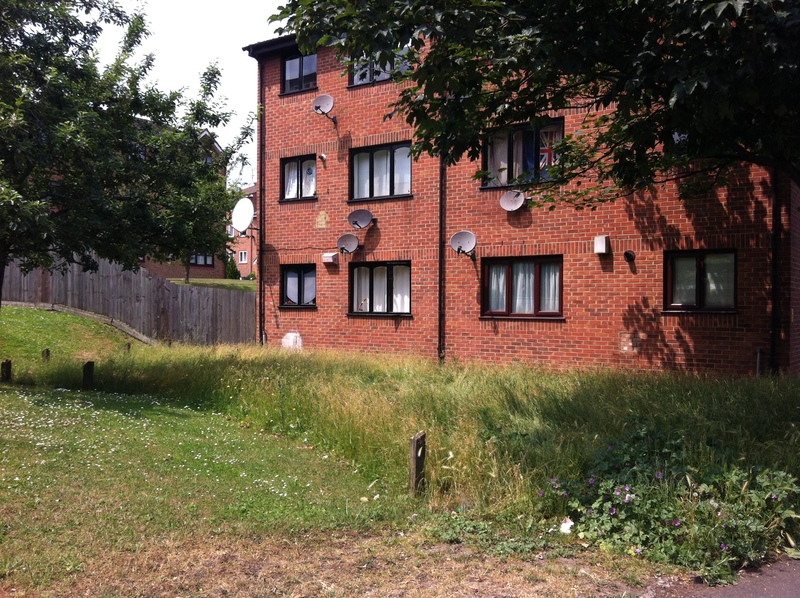 Sometimes people worry that they make a place look neglected or untidy, but this isn’t the case if the areas are clearly demarcated with tidy mown strips beside them. This shows it’s clearly a deliberate act. Meadows (even small ones) are fantastic for several reasons; they encourage pollinators and other insects, which are essential for both our food supply and which many birds and mammals depend on; they help reverse the general impoverishment of our age, where once common species have become a rarity; they bring moths, butterflies, bees, hoverflies, flying beetles into the common experience once again, thereby gladdening city-dwellers’ hearts; and – a real clincher for cash-pressed councils and parks – they save time and money. 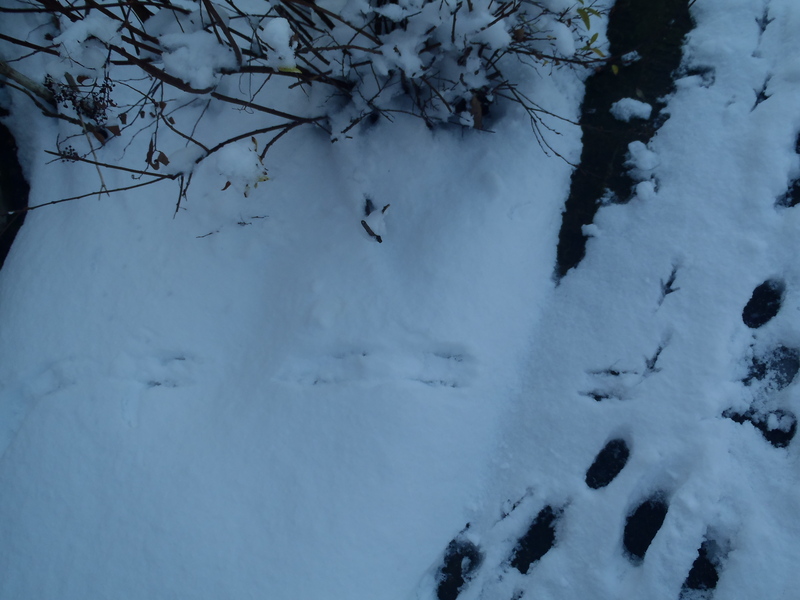 I’m pretty sure that austerity is one of the main factors behind this sudden attention to wildlife, alongside a growing awareness of the benefits. And that cheers me – I’ve finally found one positive then, out of all the injustice, pain and loss which, to me, UK ‘austerity politics’ represents. In my part-time day job, I attempt to sow wildflowers, food and inspiration in built-up urban areas. The idea is to make them healthier to live in, for both humans and other beings. Despite the huge benefits, there are many barriers to inviting nature in to a concrete jungle, both physical and psychological. I’ve heard people calling nettles and teasels ‘dangerous’ for example. Or residents worried that a nearby bat box will mean bats come stalking them through their bedroom window. Most people can enthuse about a wildflower meadow however – partly thanks to the recent media focus on wildflowers, pollinators and particularly, bees (see Sarah Raven’s BBC Series, the Olympics wildflower meadow, the recent neonicotinoid and bee campaign). Of course, I want to build on that enthusiasm and create a wonderful wildflower meadow, replete with grasses, poppies, cornflowers, buttercups and ox-eye daisies – a Jackson Pollock of colour. Unfortunately, it’s not always that simple to pull off something glamorous and eye-catching. Whilst it may look stunning in the height of summer it can turn straggly and brownish for part of the year. 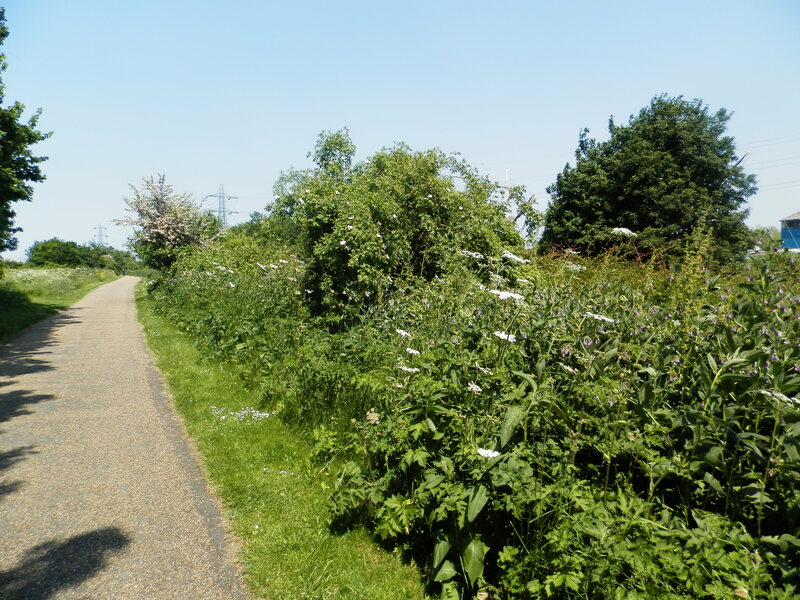 All kinds of things can go wrong: birds can eat up the seeds, housing contract gardeners can mow the meadow down too early, people can dump litter, steal plants, or let dogs poo on your great work. The best meadows need impoverished soil, plenty of sun and regular watering at the start. 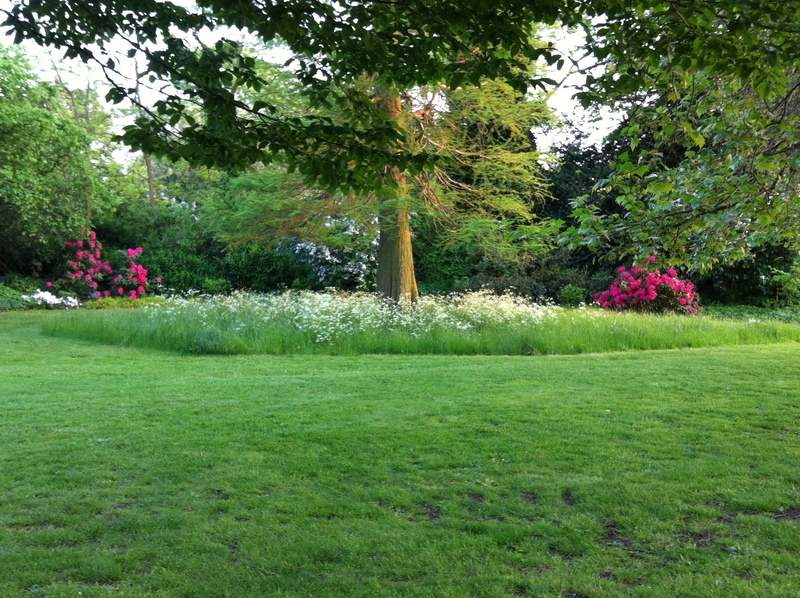 Very often in urban areas the ground is too shady or nutrient-rich (thanks partly to dog poo and previous regular mowing) to give meadows the best chance. So here I am, working hard to achieve a glorious result – and in the meantime have neglected my allotment. When I do finally turn up, what do I find? 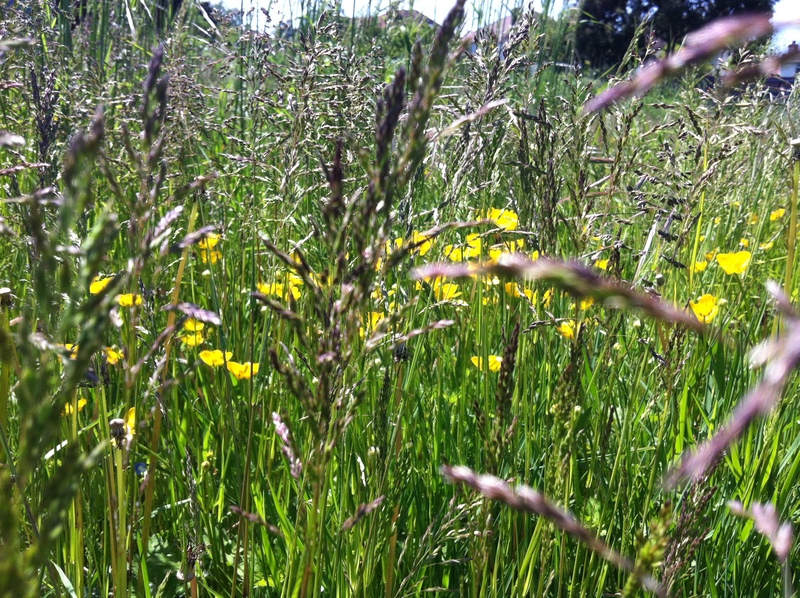 A gorgeous, entirely natural and self-seeded wildflower meadow! How perverse! Nature has created the result I’ve strived for elsewhere – but in the ‘wrong’ place. How could she do this? So rants my mind. And then my annoyance turns to admiration, humility and reflection: it is us human beings who are perverse. Meddling, egotistical, arbitrary – wanting wildflowers here, but not there. We want Nature to dance to our tune, when we say so, where we say so. But we forget we aren’t her master – we’re part of her. As featured on the new nature. I lie on my back on the grass and watch the clouds, my view framed by hundreds of newly-budding branches arching above me. I’m the only person in this vast decanted housing estate, once home to 3,000 people. There are precious few places you can do this in London without sharing the space with others. Lying here, I feel both grateful and vulnerable. There are 450 mature trees, some of them exotics, in this estate which is earmarked for development. For this reason the activists who have been trying to save the Heygate Estate trees call it an urban forest. Apart from the famous parks, nowhere else in central London has this amount of public tree canopy. It is cushioned from the dirt and noise of Elephant and Castle roundabout by the original design, which placed larger blocks on the periphery to protect its low-rise heartland. Forest. The word itself is romantic. It can mean different things to different people, but I think this site is entitled to bill itself as an urban forest as it fits the definition of ‘a large area chiefly covered with trees or undergrowth’. 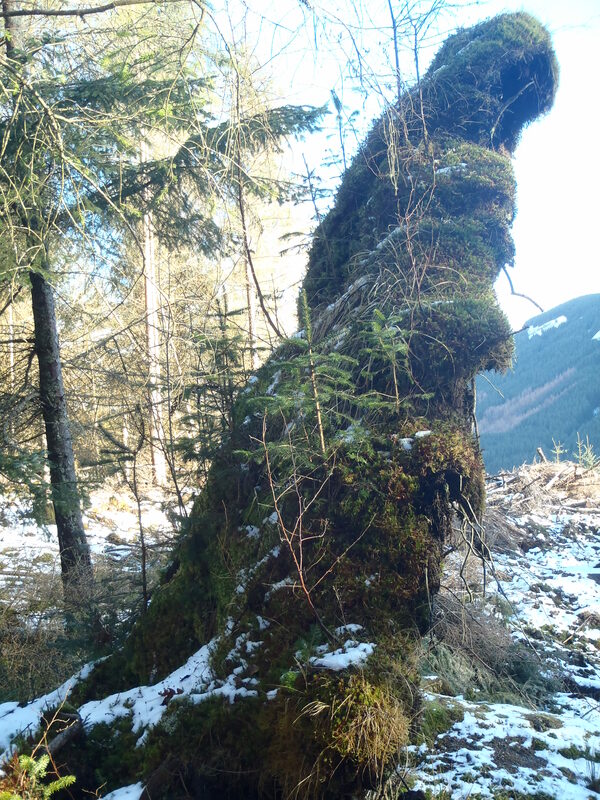 Moreover, forests have long been places with their own rules and where commoners have had special rights. I find something of this character lingers here in the Heygate Estate, as it does in Epping and the New Forest. A special bond between people and place, forged over time. It feels mournful here, as well as peaceful. Residents have created a gallery in the heart of the estate to tell the story of being forced out of their homes with compulsory purchase orders, and priced out of the new high rise development that is already being advertised to rich international buyers. Here and there you find the detritus of past lives – a broken tennis racket, a jumble of audio tape spool lying in the grass. In the three years since most residents left, nature has taken over. A quietly rampant carpet of green tears up the tarmac, and at night bats dart amongst a secret greenwood world of light and shadow. 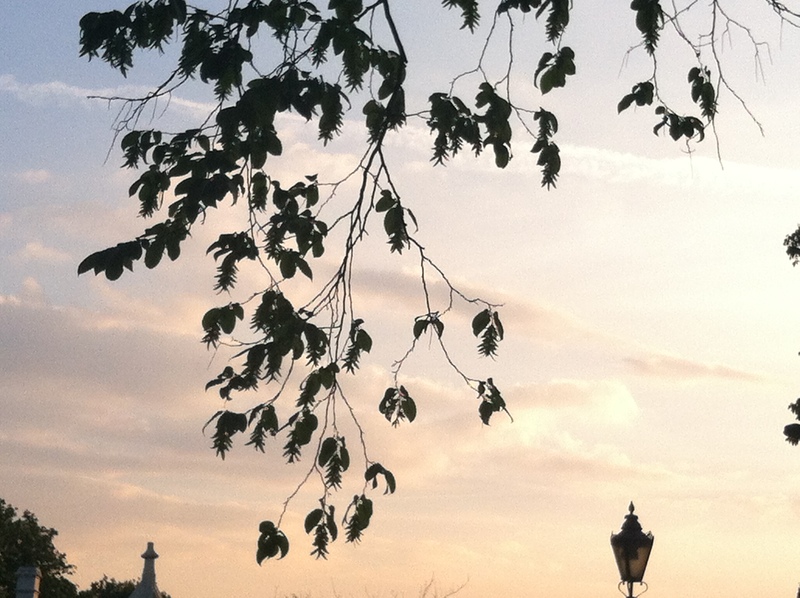 This morning the birds are triumphant, their spring song bouncing off walls and grass. 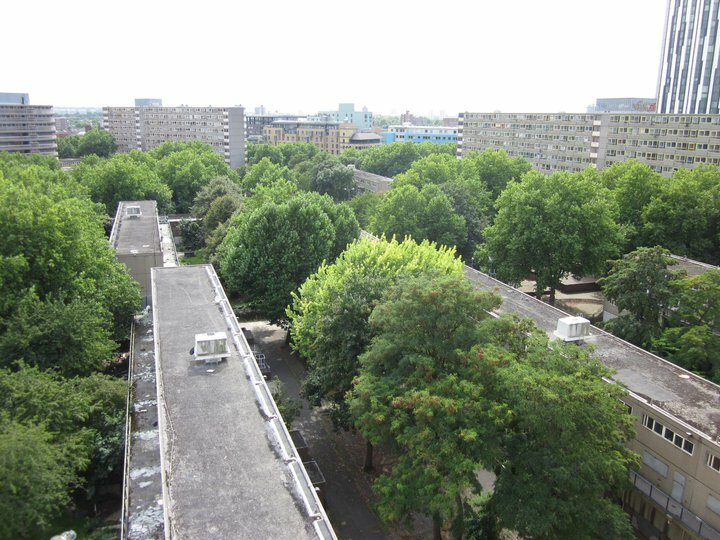 All these mature trees have finally reached the optimum height and size envisaged by the architect, Tom Tinker, when he dreamed up the site in 1969. His plans belong to a more visionary, egalitarian period, when architects and developers built high quality housing estates for all classes of people, and when government set money aside to maintain them. This is a special time, a hiatus, after the people have left and before the JCBs move in. Already fences and barriers have gone up to prevent pilgrims like me from traversing the walkways. Pretty gardens have been smashed up. 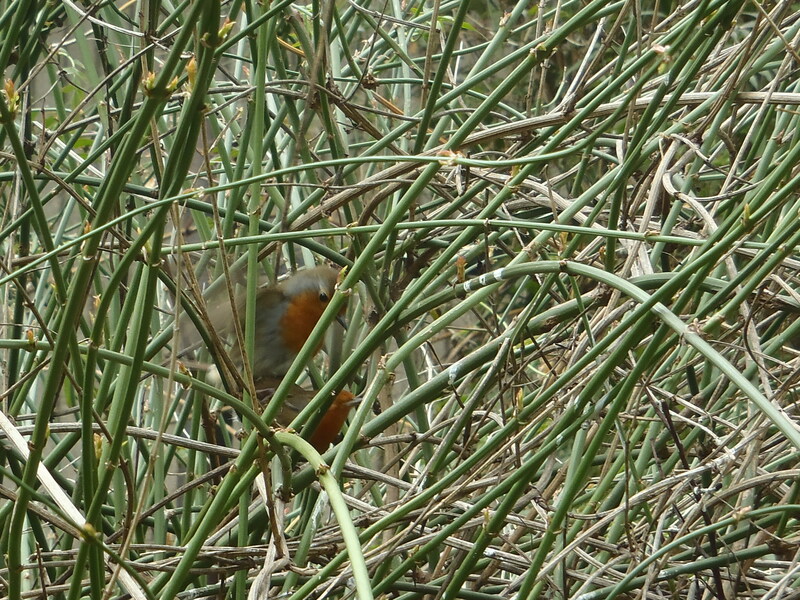 A yard or so away, a robin sings, before swiftly treading a female. 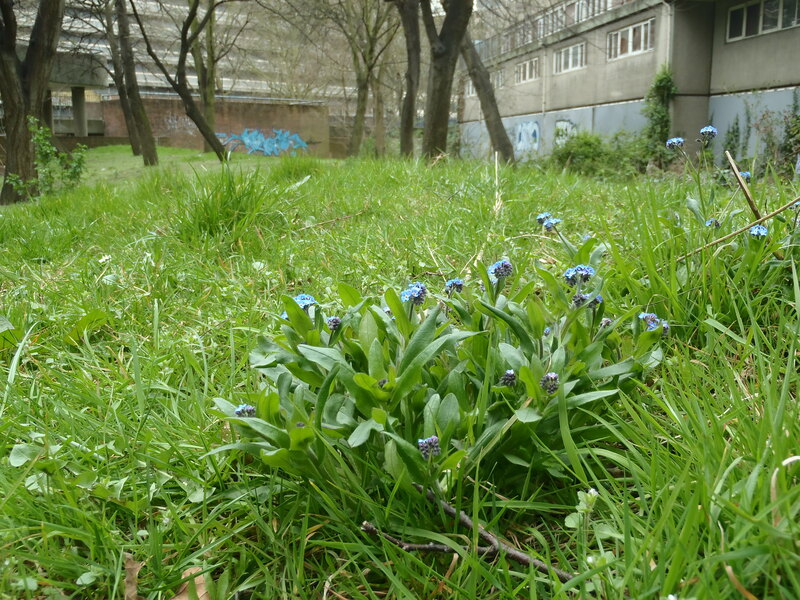 Forget-me-nots and violets stain the grass purple and blue, the former strangely mirroring the aquamarine of some graffiti on a lock-up opposite. Lichen, moss, chickweed and buddleia creep over the steps and walkways. A 3D image of a wolf’s mouth, colourful elephants and other fantastic creatures adorn some of the walls, created by graffiti artists exploiting the brutalist vertical and horizontal lines. It all adds to the feeling of this being a secret, uncircumscribed, wild place. 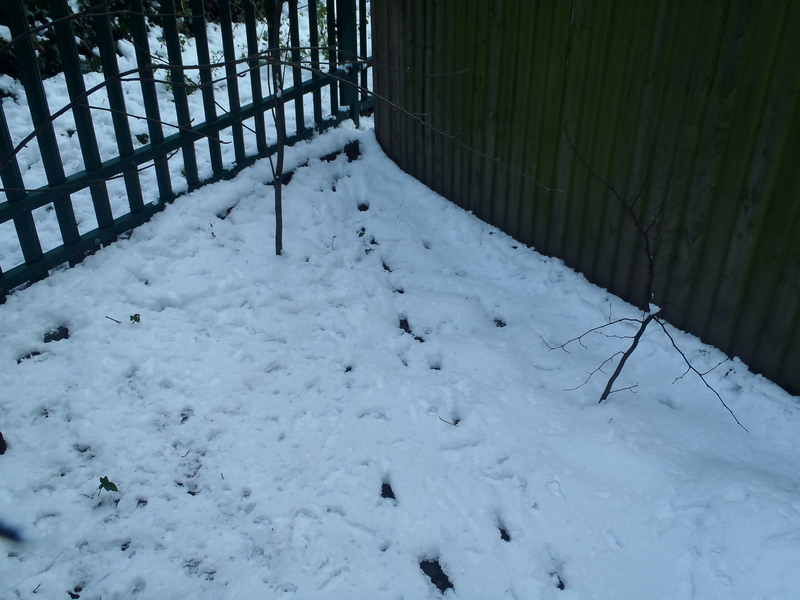 Guerrilla gardeners tended vegetable plots here last year, working alongside isolated residents who refused to move out. Broad beans and flowering lettuces sprout up amidst DIY raised beds. In one area, the gardeners stacked crates of flowers and plants up a slanting brick wall. The plants have long since escaped their plastic framework and the wall is covered in green and brown leaves, which spill and spread over the floor. How quickly we can be replaced and forgotten. A post-apocalyptic landscape, all quiet now after some great lost battle with market forces. Over 300 of these 450 mature trees will go, it seems. The developers promise to replace all of the trees they remove where they can in the new development, and in surrounding streets. But, given the housing density required to make the project “economically viable”, the forest’s days are numbered. This spring has been fast and furious, making up for the Narnian winter that dragged on for months. I’m hungry and diligent for all the signs of spring, having waited for so long. The transient beauty of tiny tree flowers is capturing my attention, unfurling with the leaves. Like the woodland here, they will be gone before we know it. 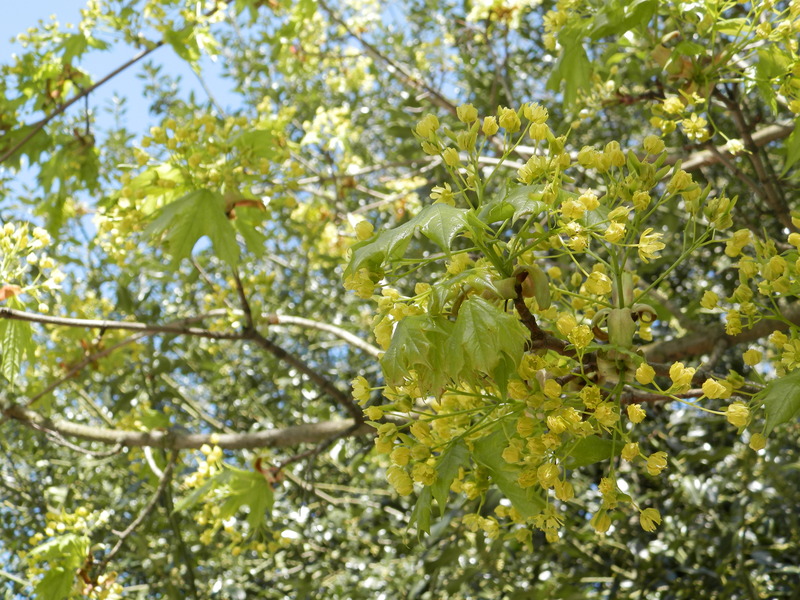 I’ve really enjoyed noticing flowering trees this spring, hungry for signs that the Narnian winter was on its way out. 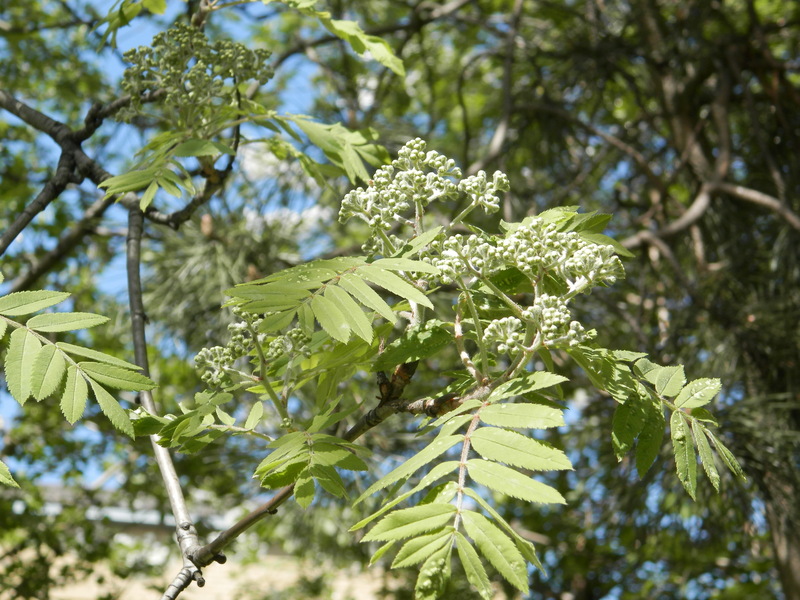 Many wind-pollinated trees put out tiny flowers before, or alongside, their leaves, as leaves can get in the way of this process. Sitting on the top deck of the bus is great for noticing them high in the canopy. They’re easy to miss, and given the pace of growth this Spring, will be gone before you know it. A simple way to connect with nature in the city. 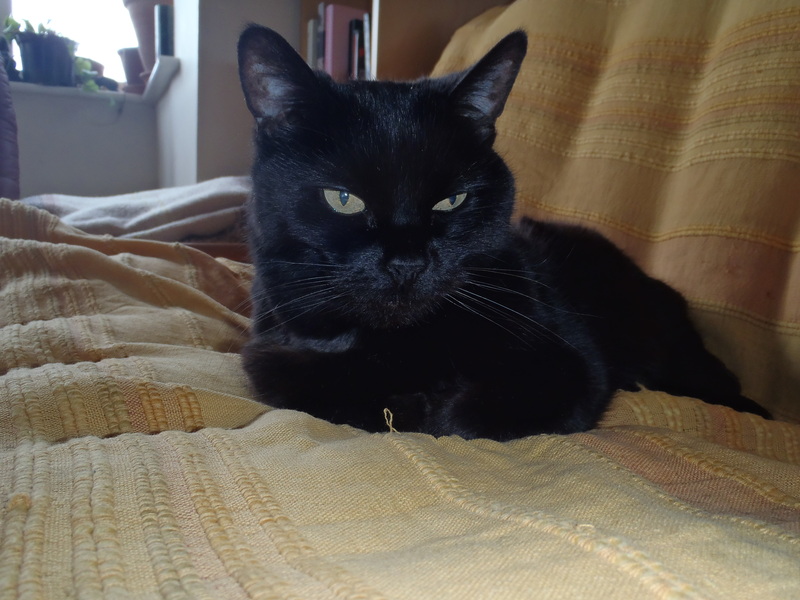 A beautiful rescue cat has recently come to live with me, and she is wild and lovely in many ways. No-one knows how old she really is, but we guess somewhere around 10-14. That means she’s on the elderly side, but she doesn’t act that way. She behaves like a new kitten, charging around the flat transforming crumbs, elastic bands and plastic bags into her toys. She plays ferociously. However, in some ways she is just as denatured as the rest of us. Ok, I know that the domestic cat is itself a ‘man-made’ creature, but over the past twenty years the cat – all pets – have become massively commodified. I climbed a steep learning curve the first time I walked into Pets R Us and saw the scale of ‘choices’ awaiting me in the food section. There was food for indoor cats, food for kittens, food for special breeds, food for obese cats (‘Obesity Management’); on and on, the products filled an entire wall in the megastore. When I was a girl and grew up with cats, vitamins and minerals were never mentioned. Now on every packet it seemed special cat-related minerals and vitamins had been added to meet ‘a healthy cat’s needs’. I looked at some of the ingredient lists and shuddered inwardly at the ‘reconstituted poultry meat’; a large proportion of the food seemed to be vegetable oil. But nowhere in this confection was there any raw meat, despite this being the diet cats have evolved to live on. What feline in the world consumes cooked food? Yet this is what we are told to feed our cats, and then charged for the extra vitamins and minerals needed to make up for the fact that we’re feeding them something un-natural. In the past, cats worked for their living, and if they needed anything extra, people fed them meat and fish scraps and bones from the butchers. Somewhere along the line we’ve forgotten this, and now are duped into shelling out yet more cash on food and supplements. And of course pet insurance to cope with all the ailments that arise from eating a junk food diet. Cats often experience problems with their teeth nowadays, but this wouldn’t be the case if they followed a natural raw diet, because animal bones provide the necessary calcium and trace minerals as well as necessary teeth-cleaning effects. So it’s important for a cat to learn how to chew bones. Another trumpeted amino acid is taurine. There’s no need to supplement with this if you give your cat fish heads, because the eyes in particular have plenty of this so are really nutritious to cats. So I was pleased that I was cooking trout the following day – this way I wouldn’t have to throw away the fish heads or tails – they would go to good use. 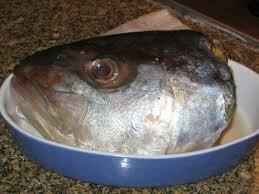 Unfortunately, when I put them in her bowl, although she liked the smell, sniffing at them was as far as she would go. She had no idea how to eat them, and subsequently ignored them. I thought of chopping them up, but if anyone out there has tried, you’ll know how slimy and impossible this is to do, without a meat cleaver, at any rate. I realise now that the only way I’m going to get her to eat raw meat is to chop it up small and hide it within her ‘de-natured’ tinned food. Some older cats can be weaned back to their original diet this way, I’ve heard, though by no means all. Some have become so addicted to the carbohydrates and additives in the cooked tinned food they’ve been given, they are hooked for life. Just like so many of us with our sugar addiction. 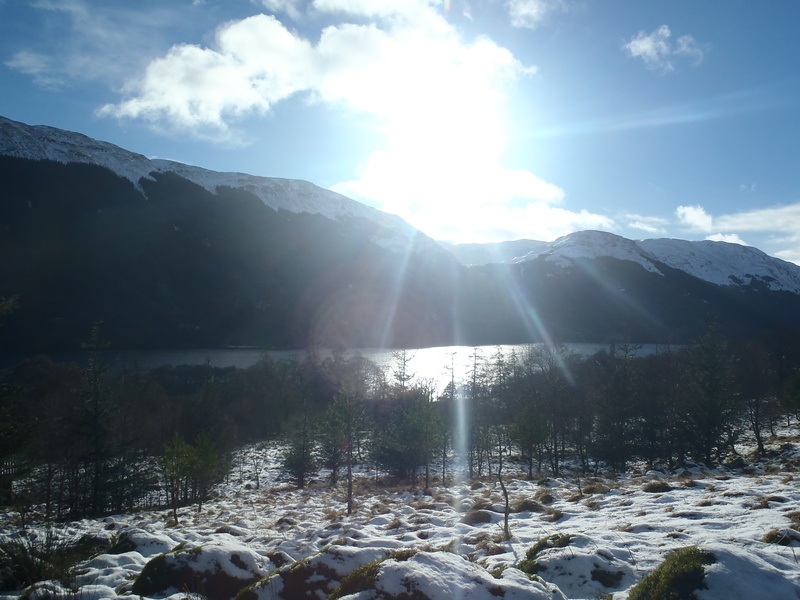 I recently spent two weeks on a silent meditation retreat deep in the Scottish Highlands. I’ve done a silent retreat before but it was only 7 days long, and it was four years ago. I don’t meditate as regularly as I’d like to. So I knew this retreat would be a bit of deep dive. Like the weather, my moods and feelings kept changing mercurially, so what follows is not a literal day by day account, more an impression. The meditation posture (whether cross-legged, kneeling, or sitting) in many ways is the meditation: it’s all about rooting ourselves in the world, like a tree, balancing that movement down into the earth with a rising up to the sky from the upper body. Days 1-3. To help us along, and because in some ways ‘the nature of reality is poetic’, the meditation teacher dropped in some splendid poems from time to time. To sit in stillness, feeling your body and sensing the landscape around you, and then encounter a poem like this one made it possible to enter a much deeper realm of experience. Day 2. Weather turns wild and fierce, the wind hurtling and crashing down from the mountains all around us. 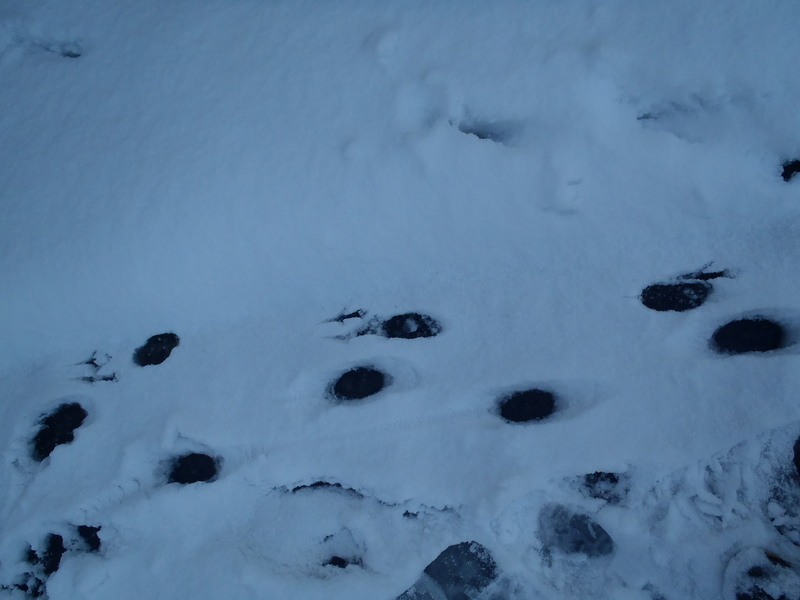 I wake in the night as the house shudders violently, as if a gigantic animal has just leaped over it. At the sunrise meditation, I see a small sprightly 65-year-old woman doing Tai Chi in the midst of it all, valiantly greeting the elements through extended limbs as gothic black clouds rush above her. 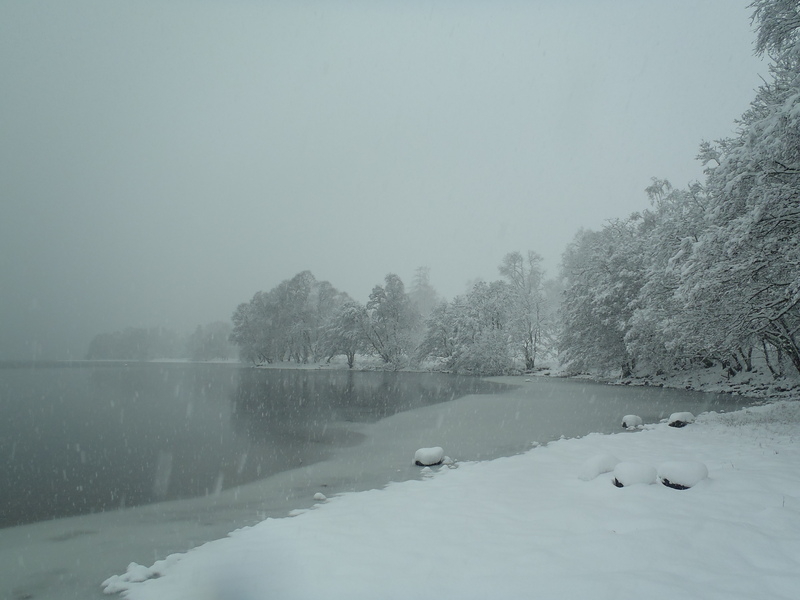 Snow falling thickly by end of day. Day 3. The silence allows you to eavesdrop on some of your crazy thoughts, which can be uncomfortable. I want a pair of those ski socks she’s wearing. I’m the best meditator here! Look, I can just sit here looking out the window without having to pick up a book! I’m becoming much more aware of sounds and physical sensations. 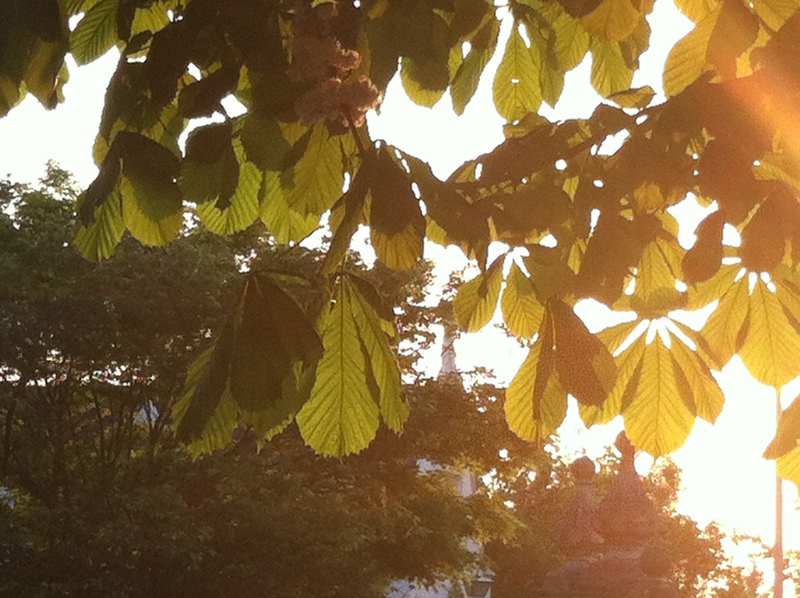 Occasional aeroplanes soar overhead and the sound enters the meditation room. Have I ever noticed musicality of aeroplanes before? Maybe when I was a child. Today I hear the sound of the engine far above me descend through the musical scale. Not only that, I see an attendant image – a dark inky rectangle of blue paint, which moves as the note descends, almost like I’m seeing the sound in colour and movement. Hearing the rain on the other side of the stone wall of the meditation room, I feel a connection between me, the rain, and the stone. We are all part of this landscape, in this moment. Day 4. 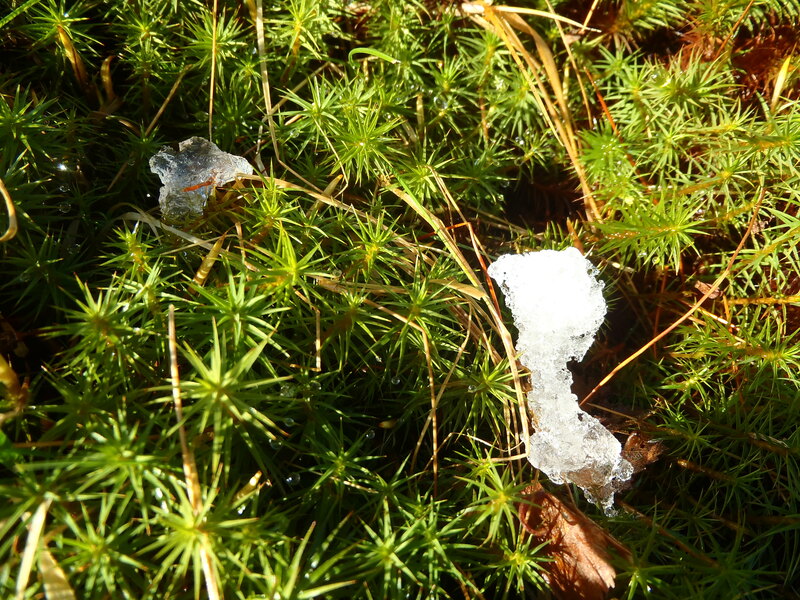 Snow starts to melt and I venture out into a sparkling new world. I find a tiny clover under a pine tree and wonder at it: how could something this tiny and lightweight survive the past two days’ battering? 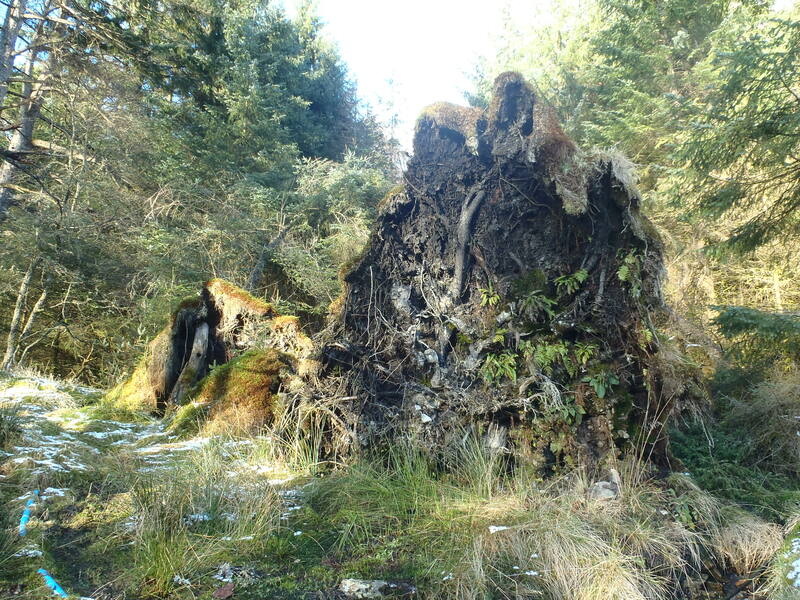 The Buddhist emphasis on the impermanence of all things is borne out by the life around me, where fallen trees, taken by earlier storms no doubt, sprout myriad new life forms; pools, ferns, lichen, moss and fresh saplings. 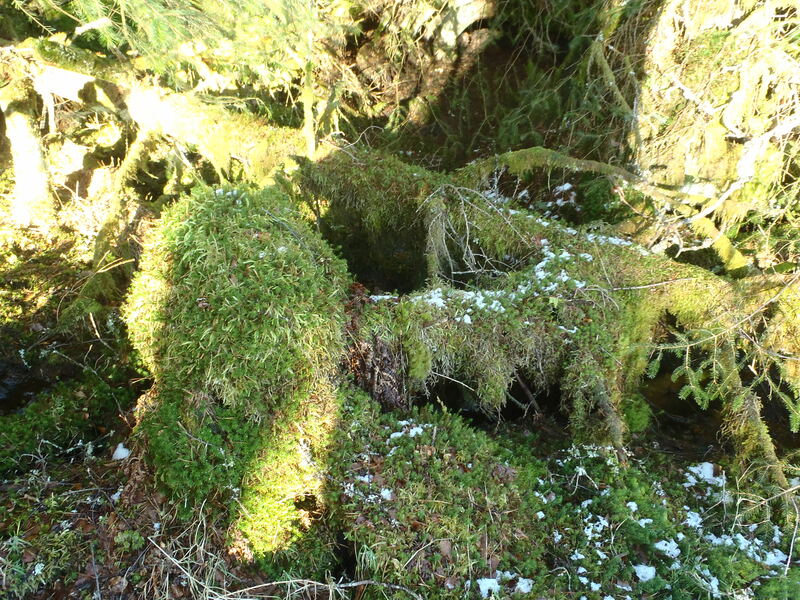 Is this a branch or a clump of moss? Everything is in process of transmutation. I’m noticing a lot of judgement. It’s difficult to sit in a meditation room day after day with a group of strangers. You develop a reluctant intimacy with each other’s bodily functions. Stomachs gurgling, noses running and whistling, breath clicking, swallowing, belching…is this amount of noise normal? We do a Metta Bhavana meditation on loving kindness and someone starts sobbing. Shut up! My ‘small mind’ wants to slap her. Day 5. I’m the worst meditator here. If it’s just sitting, why don’t I go on a fishing holiday? Then again, a dancing holiday would have been much more enjoyable. At times I’m feeling trapped and bored to the point of exasperation with the relentless framework: wake at 6, meditate, break, then another meditation before breakfast which is taken in silence, then another meditation session from 11 onwards, then lunch, then meet again at 4 for another session, then dinner, then one last evening session after dinner. The bell keeps on ringing and sometimes I skip a session and sleep instead, or go for a walk. Then other times I feel peaceful, more immersed and think: ‘Great! Another 9 days of this!’ I’m realising I shouldn’t take a lot of thoughts too seriously – they change as fast as this weather. Day 6. I really need to get out of the city more. I’m noticing my default urbanised response to things. Groggy, early morning, half awake after a poor night’s sleep frayed by tinnitus and a bad stomach, I hear my room-mate’s shower water pouring down the drain. Well I don’t – I hear a police siren. Then later, gazing out of the skylight in the meditation room I see part of crane – except it’s not, obviously, it’s a tree limb. I’ve suffered from tinnitus for the past four years or so, but haven’t been aware of it for ages. Now, in the quiet of the meditation room, it’s come back, and it’s driving me mad. The Buddhist take on this is that there is pain in this world: that’s inevitable. However, the suffering which our egos add to this pain is not. It’s the way we try to escape pain, or crave sensory and other pleasurable experiences – this is the root of our suffering – our ego’s difficulty with being with what is. So I try to tell myself that how I feel now will likely change, try not to fret about the future (will it go? will it get worse?) and that my experience of the tinnitus will likely change as well. I’m feeling down and sad. I try to accept this. It’s tough. 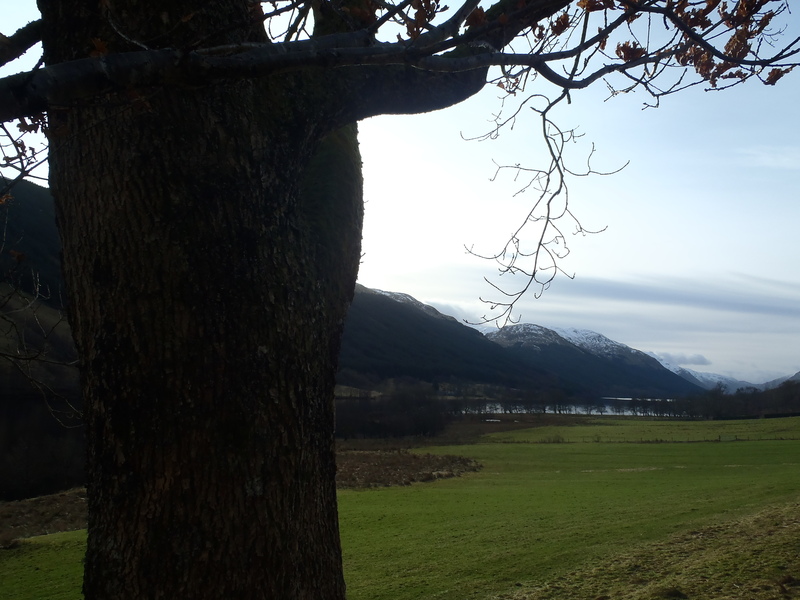 A beautiful walk down to the lochside. The gentle water slurps and licks the shore like a mouth. A sheep seems to try to hide from my binoculars behind a tree – I can just see its muzzle peeping beyond the trunk. For a while standing there, I’m convinced there must be someone nearby, someone with a transistor radio, because I can hear constant murmuring high-pitched voices. It takes a while to realise there is definitely nobody around, and trace the ‘women’s voices’ to a tiny burn bubbling over some stones. I never heard water make a sound like that before. Maybe that explains the old stories about mermaids and sirens. Day 7. I’m the worst meditator here. Not this again. This isn’t working for me. Tired, still not sleeping well, the volume of pulses and grains are doing uncomfortable things to my belly. Finding myself reading cereal and cracker packets in desperation at the lack of stimulus. ‘Nairns Crisps. Naturally energising. We’ve been baking since 1888.’ What the hell am I doing? Enjoying hearing owls at night and early morning. Also birds of prey keening over the loch and mountains. Day 8. Better. Realised it’s ok not to be too rigid with the meditations and the instructions. If the technique ain’t working, ditch the technique. 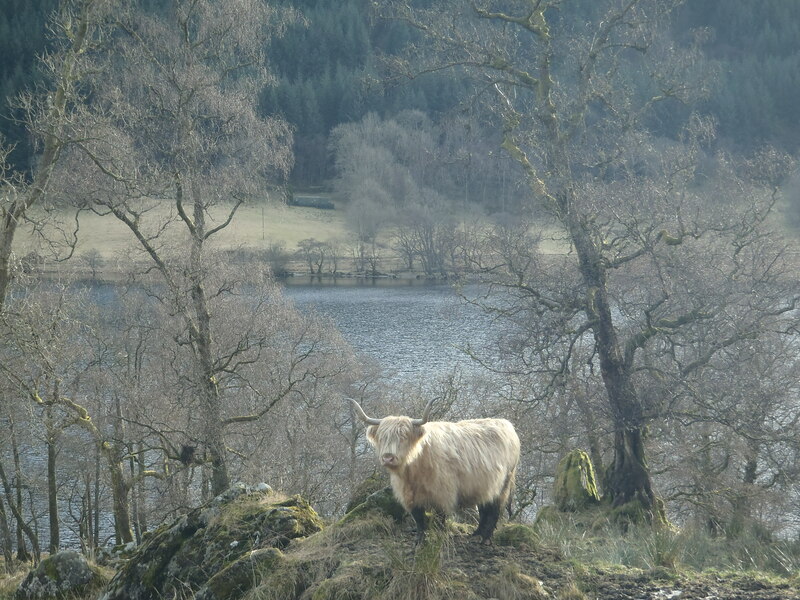 Felt a gentle joy by the loch’s edge sharing a mutual stare with a sheep as it chewed the cud, first one way then the other. Enjoying some beautiful body scans – imagining breathing in one side of the body, then out the other side of the body. Repeat on the other side, then the same up one leg and down the other. When one is concentrated and involved, then this experience is unbelievably peaceful. At times I’ve become aware of myself as a life force inside my body, inside looking out. At other times I’ve felt myself as empty, like a vessel, and a sense of disbelief at the small size of my physical body, as if I were really much larger, part of the landscape in some way. Day 9. I‘m the best meditator here. I’m the worst. Etc. Really enjoying the chanting of some of the mantras. Especially when I let myself sing harmonies and when we do cloud chanting (different people coming in at different times). At times it feels like the singing is just coming through with no effort from me at all, and I can’t tell whether it’s my singing or others I can hear. It’s as if we’ve all become one giant Tibetan singing bell which is playing itself. I hear the faint cry of a bird of prey above the loch. Except it’s just the air whistling through my meditation neighbour’s nostrils. Day 10-12. Several days of moroseness, blankness, distraction and frustration. 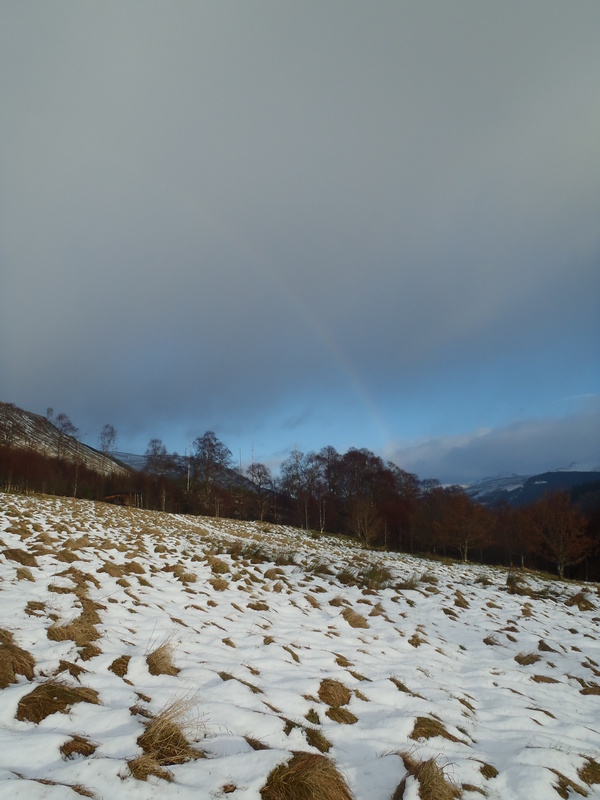 I climb a low mountain to the snowline and feel a bit better. 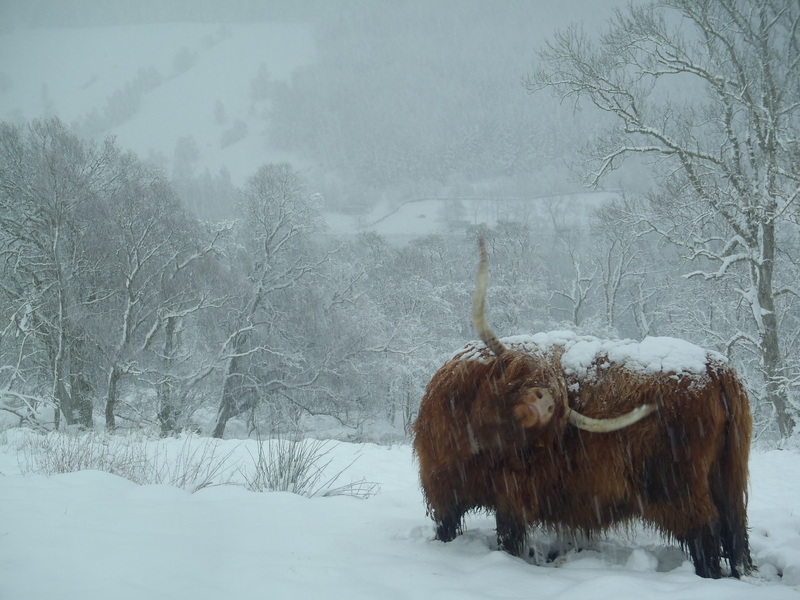 I chant some of the mantras to the Highland Cattle nearby on my walks, who are the epitome of impassiveness. Nevertheless, one always stands on a high point looking out over the water. There is nothing much to eat on this spot and she is not chewing the cud. Yet there she stands. I can only assume that she likes the view. Who knows, perhaps she meditates. Day 13. We come out of silence after lunch. I’m surprised to realise that part of me doesn’t want to. Realised that despite the silence over the days we’ve built up an intimacy and caring between the group members (about 15 of us). Strange to know this is possible despite very little verbal contact. 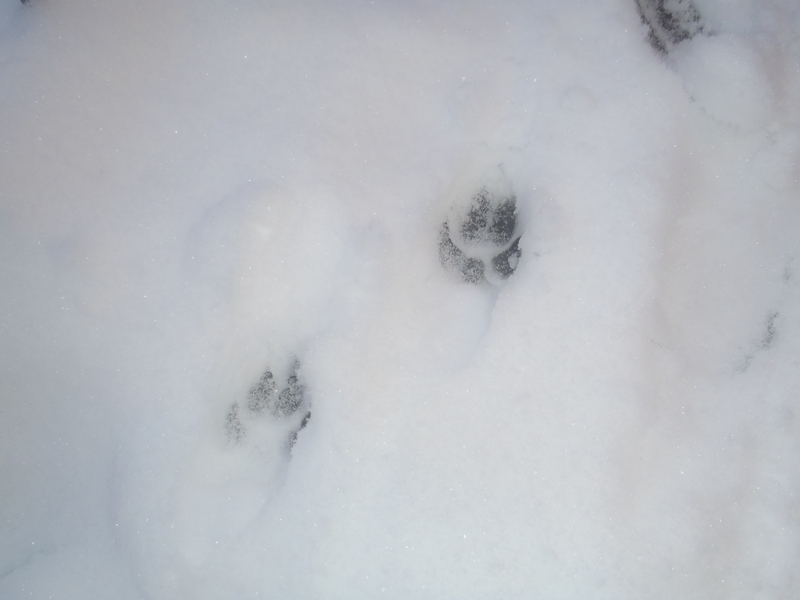 Eleven inches of snow falls, spreading the silence all over the blanketed landscape. Great to share with others after so long, but speaking is still rationed: we will still stick to silence over night and up til lunch the next day. 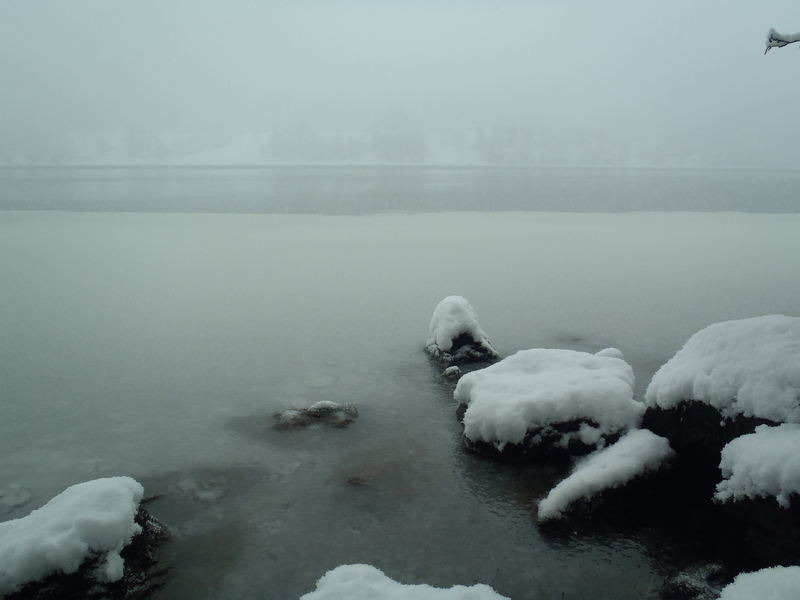 I like this blend of sharing and silence, which has now spread beyond our group to the snow-blanketed landscape. Tonight, after the last meditation, I glimpse the Northern lights for the first time. I nearly miss it because I assume the moving floodlight over the trees is a helicopter. I must get out of the city more. I go back outside to glimpse a massive orange streamer flexing like the muscle of a huge creature hidden behind the sky. Then a massive stripe of firework-type light bounces across the entire horizon, as if an invisible hand has waved a massive wand. Day 14. Group sharing is amazing. I wish this could have happened earlier; I might have realised that I wasn’t alone in some of my difficulties. Am deeply moved and admiring of the raw honesty of other group members talking about their experiences. I see what has happened over the past two weeks in a much larger context. 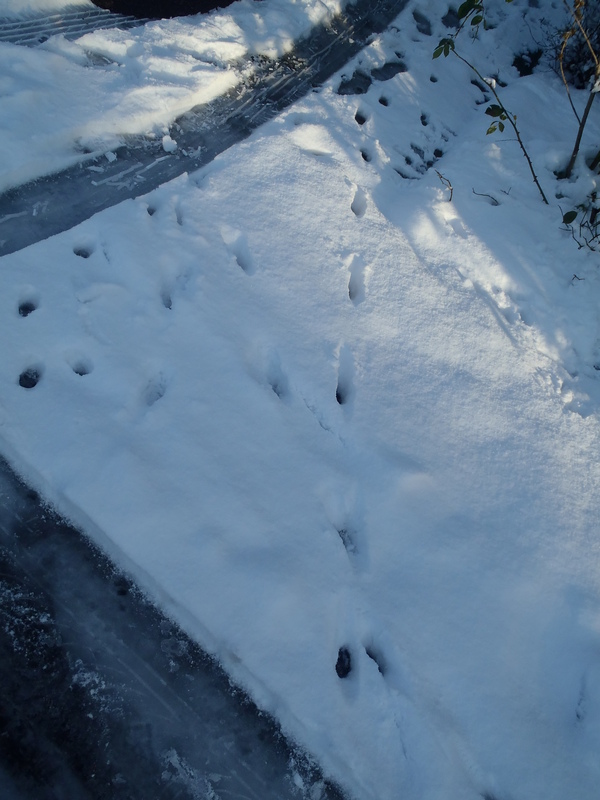 I took the advantage of the fresh snow to get some information about what kind of crepuscular/nocturnal creatures could be lurking around my home – human and non-human! 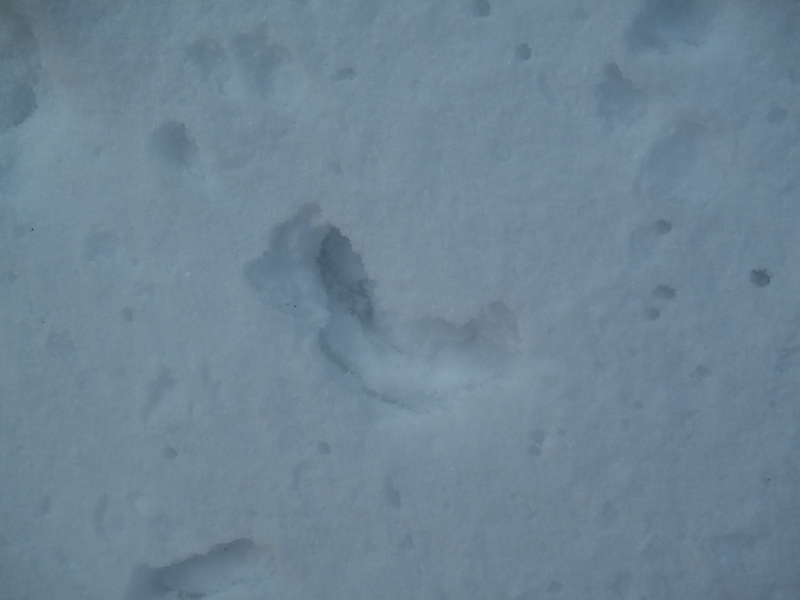 It was fascinating to get a glimpse of last night’s activities, most of which seemed to have happened behind bushes, sheds, and lead to and from the nearby railway embankment… A fox track is supposed to be very dog-like, but far more compact and oval in shape. The print has four digits with the outer two curved towards the inner ones. I think these may qualify? I found other tracks much harder to read. 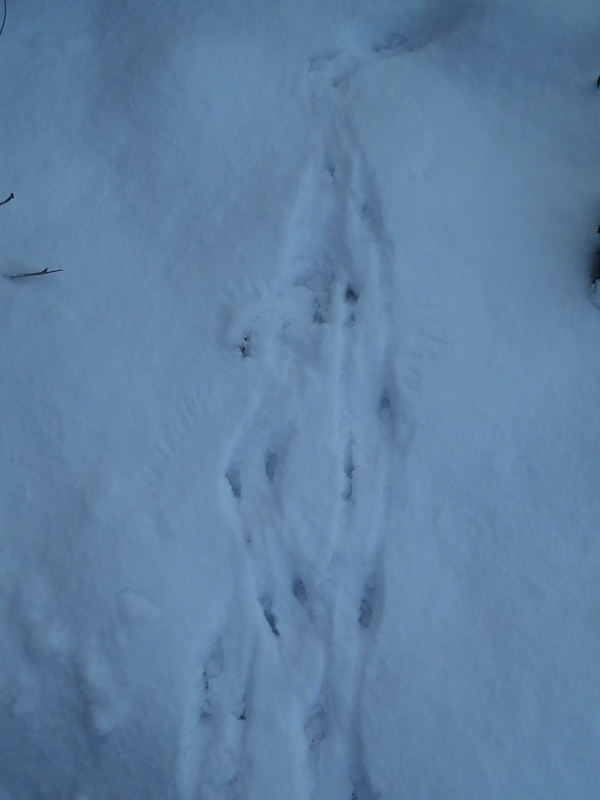 Some indentations were simply airholes, other shapes caused by seeds and twigs..an intriguing record of the last night’s activities. 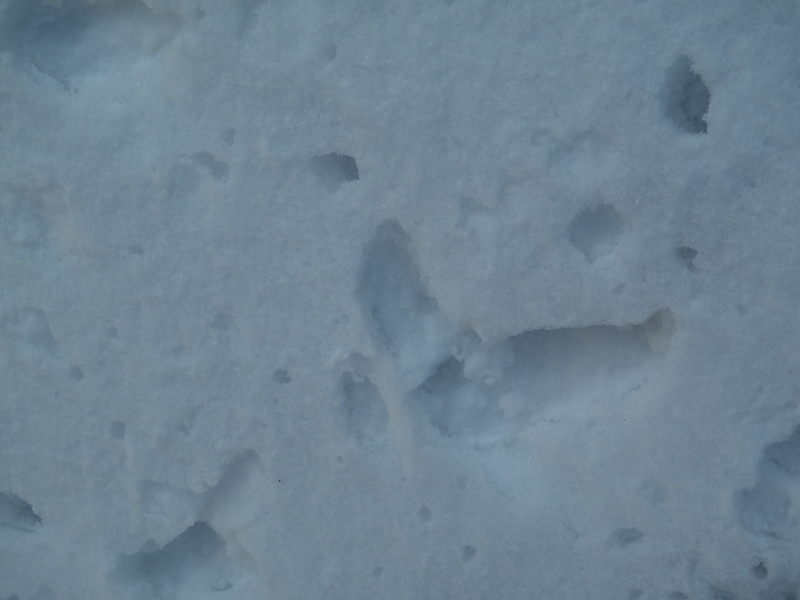 What did these two similar shaped marks signify, for example (about the size of my palm) ? 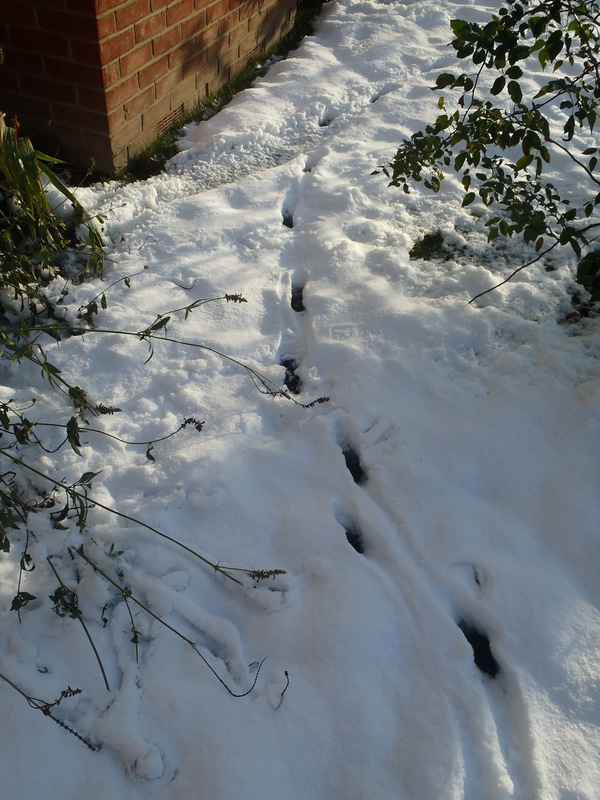 I took one trail to be a cat, which suddenly seemed to do the splits as it turned a corner…. 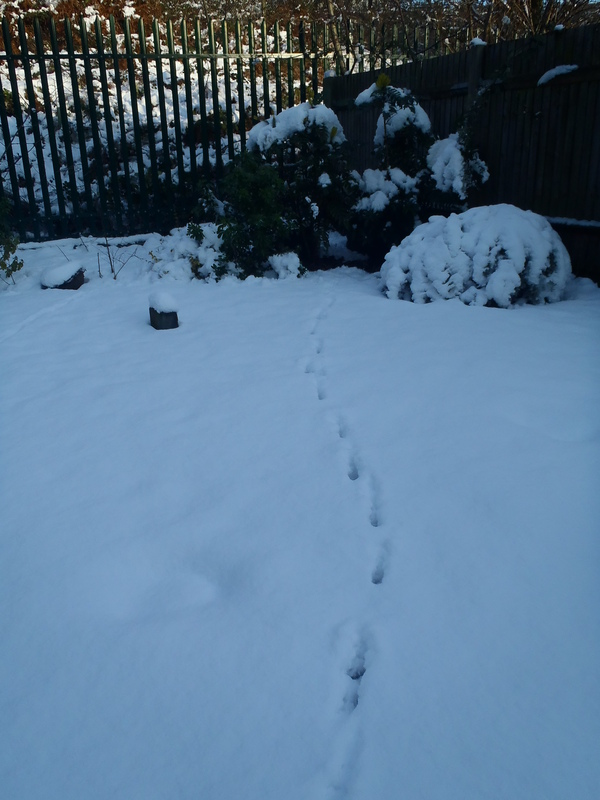 Obviously it hadn’t, it must have been a convergence of two cats, which had then gone their separate ways. 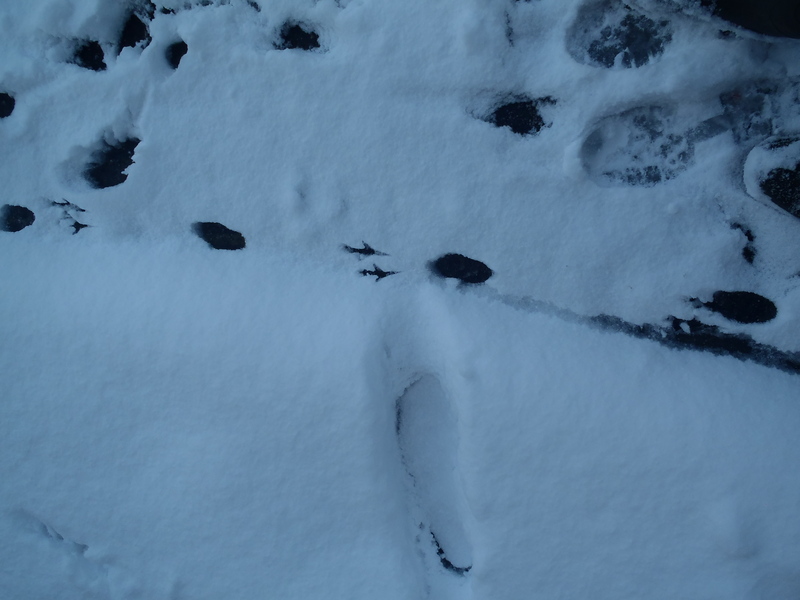 There were a lot of markings at this meeting point, one set of which which really puzzled me. Any guidance much appreciated! 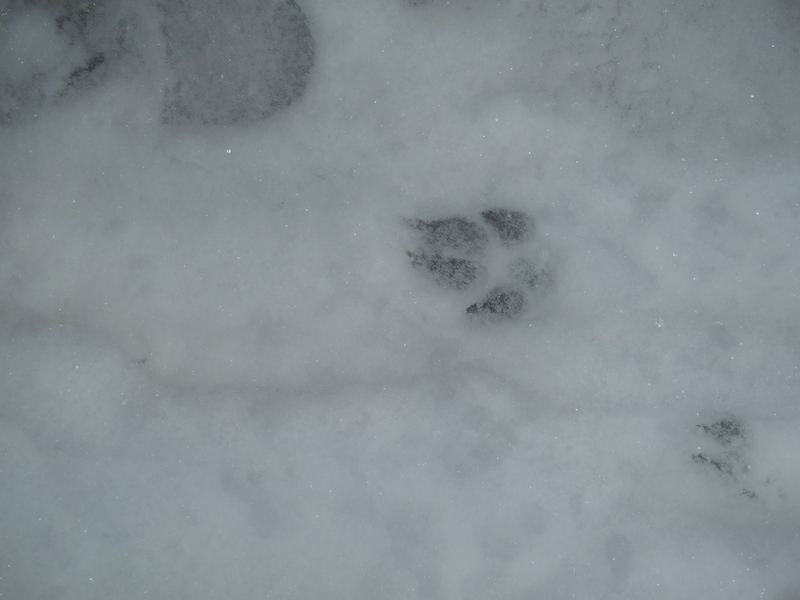 Could this be a complete track with large kidney shaped pad and two claws in front? If so it doesn’t match any animal round here I can think of. 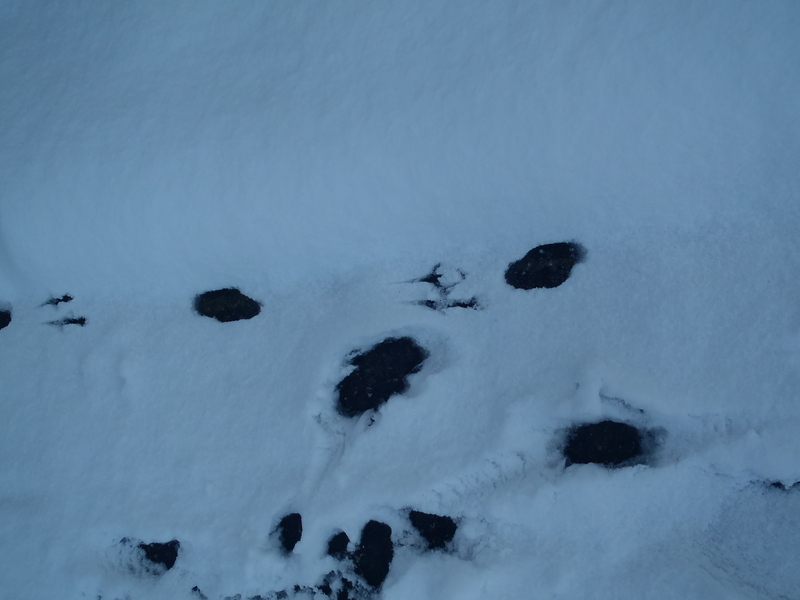 Or is it more likely, two tracks combined – the pad of an unknown larger mammal and the ‘claws’ the feet of a bird? A relaxing way to spend an hour or so. I hope I’ll get better at reading the signs – if anyone recognises any of these, let me know! I recently attended a full moon party in a forest. 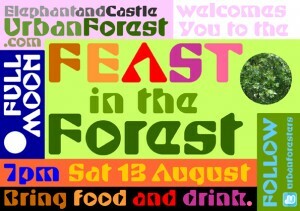 A romantic idea, you might think, but what if I told you this forest gathering was in the middle of an innercity housing estate? In Elephant and Castle, SE1 to be exact? 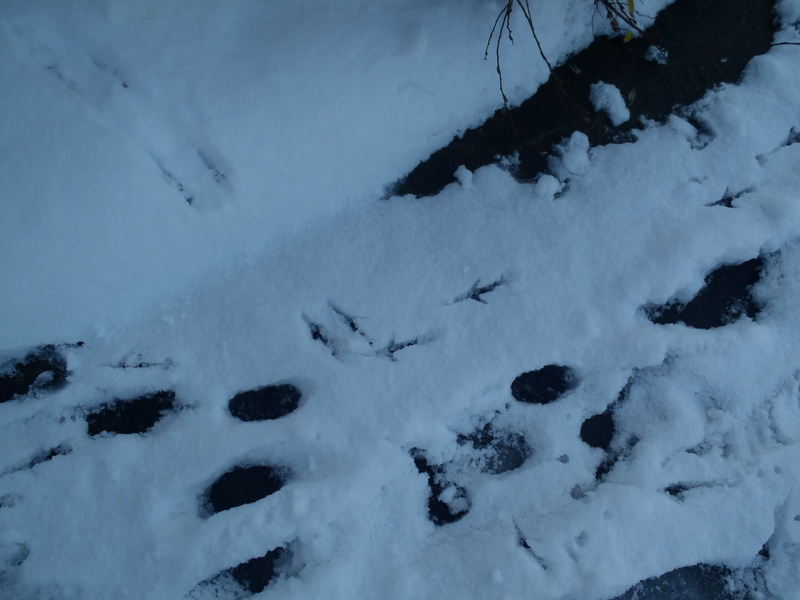 I tell you, it was romantic…..perhaps even more so than if it had been a wood in the countryside. You see, this estate has only a few residents left, the rest having been strong-armed and intimidated into leaving, and in 2015 the whole area will be demolished. Two years ago most residents left, and since then nature has taken over. There are bats here, birds, and 450 magnificent mature trees, some of them exotics. More than that, at night there is a secret greenwood world of light, shadow, whilst a quietly rampant carpet of green tears up the tarmac. Forest. The word itself is romantic. It can mean different things to different people, but I think this site is entitled to bill itself urban forest as it fits the definition of ‘a large area chiefly covered with trees or undergrowth’. 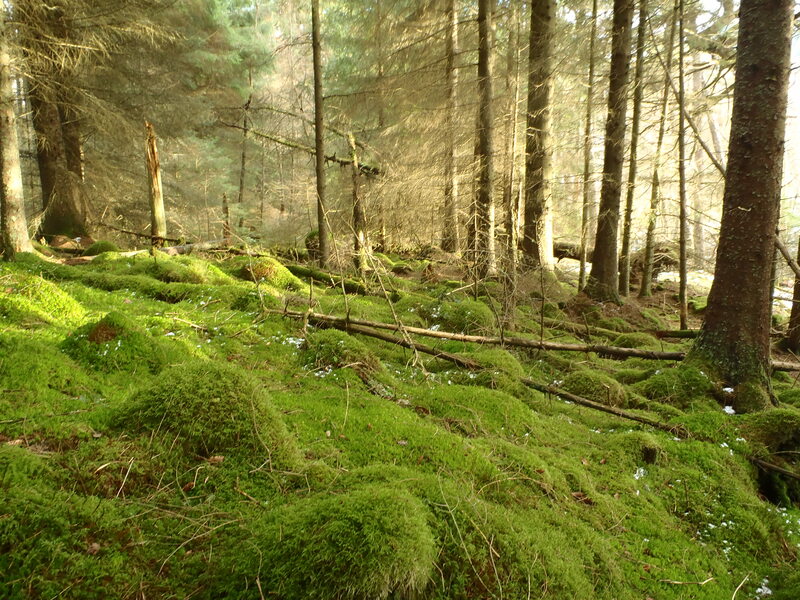 Moreover, forests have long been places with their own rules, and where commoners have had special rights. 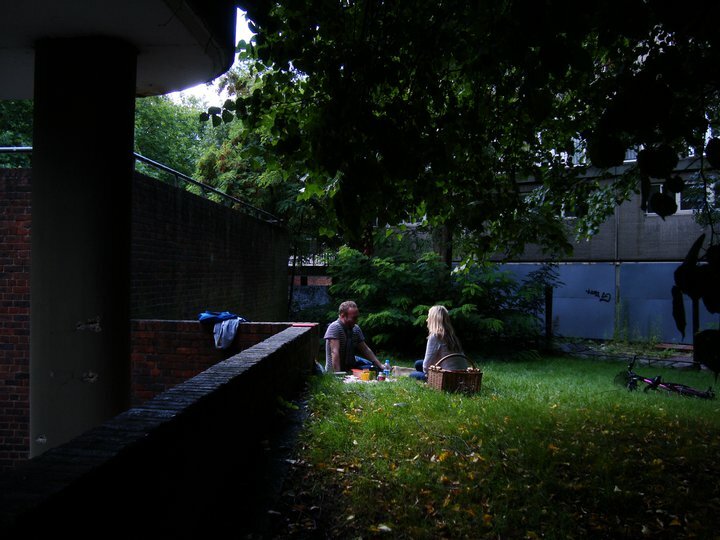 I found something of this character here in the Heygate Estate, just as there is in Epping and the New Forest. A special bond between people and place, forged over time. All these mature trees have finally reached the optimum height and size envisaged by the architect, Tom Tinker, when he dreamed up the site in 1969. He designed all these trees, shrubs and green space into the plans, arranged with low-rise housing inside a ‘heartland’ protected by larger blocks on the periphery from the surrounding traffic and noise. His plans belong to a more visionary, egalitarian time, when architects and developers built high quality housing estates for all classes of people, not just the worst off, and when government set money aside to maintain them. (For more on this I recommend Tom Cordell’s excellent documentary Utopia London). Allegations of profiteering are backed up by the fact that there is nothing structurally wrong with the buildings. Private investors will make a fortune from replacing family housing with up-market units packed in like sardines. Of course they don’t want a few trees getting in the way of those profit margins! Original plans of the redeveloped space showed that most of the trees would be lost. A community of over three thousand people has been decimated, sent to different corners of the borough, most never too return. It’s too late to save that community, but an inspiring and determined group of activist residents hope it is not too late to save the trees. 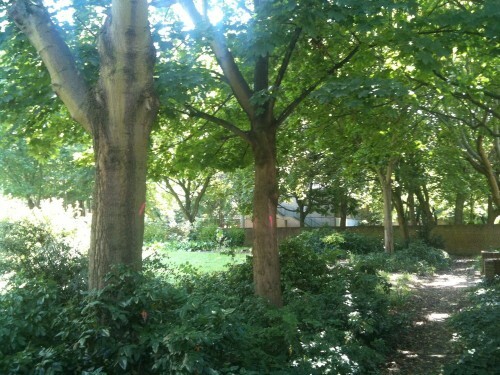 Earlier this year they conducted a CAVAT (Capital Asset Value for Amenity Trees ) study into the value of the trees, believing that Southwark Council had badly undervalued them as collectively being worth £700,000 – the same value as a single plane in Westminster! 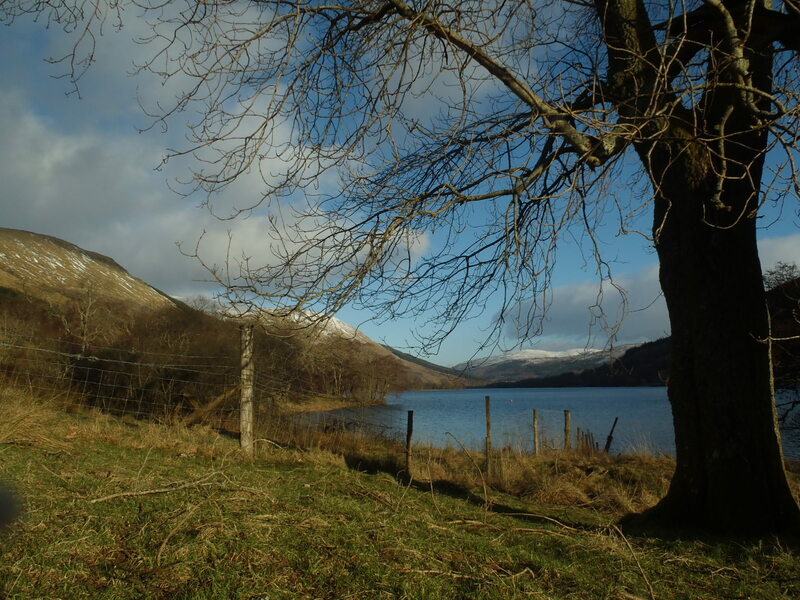 According to the CAVAT valuation, which is backed by the Forestry Commission, the true value is in fact £15m. It might seem sad that we have to express the value of trees and green spaces in financial terms – part of a wider trend to equate cash values with so-called ‘eco-system’ services. Yes – but it’s also a pragmatic response to the fact that money is the only language our current system understands. If you want to protect something, you have to put a price on it. Unfortunately developers and bankers have been better at doing this than environmentalists. I took part in a CAVAT training workshop recently, where I met the creator of the valuation system, Christopher Neilan. He conceived of CAVAT over 12 years ago after becoming increasingly frustrated at the disposable way in which trees are treated in urban areas. He wanted a valuation system which would reward tree officers for maintaining trees, and which would enable them to argue for greater budgets and investment in their tree stock – just like officials negotiate for budgets to maintain other assets, such as roads and property. Accountants reckon that 10 per cent of any asset should be spent on maintanance – but traditionally tree officers haven’t been viewing at their trees in this ‘asset’ type way. CAVAT is interesting in that not only does it measure the value through factors such as species, age, health, canopy, and size – it also takes into account the ‘ecosystem services’ of a tree – things like stabilising temperature, preventing flooding, cleaning the air and benefiting the mental and physical health of residents. Unlike other systems which tally the tree’s value to the price of land (which would mean that trees in richer areas are worth more than those in poorer areas) under CAVAT, the more people who live or work near the tree, the more it is worth (which means that a tree in poorer, higher density areas like the Elephant and Castle will be worth more than the same kind of tree in Bromley, Kent, for example. CAVAT was envisaged as a tool to protect trees, and it has already been used successfully . Recently in Bristol a number of mature trees were damaged when utility pipes were laid, and the tree officer there used CAVAT to successfully argue for adequate compensation – which enabled him to not only replace those trees, but invest in others elsewhere. 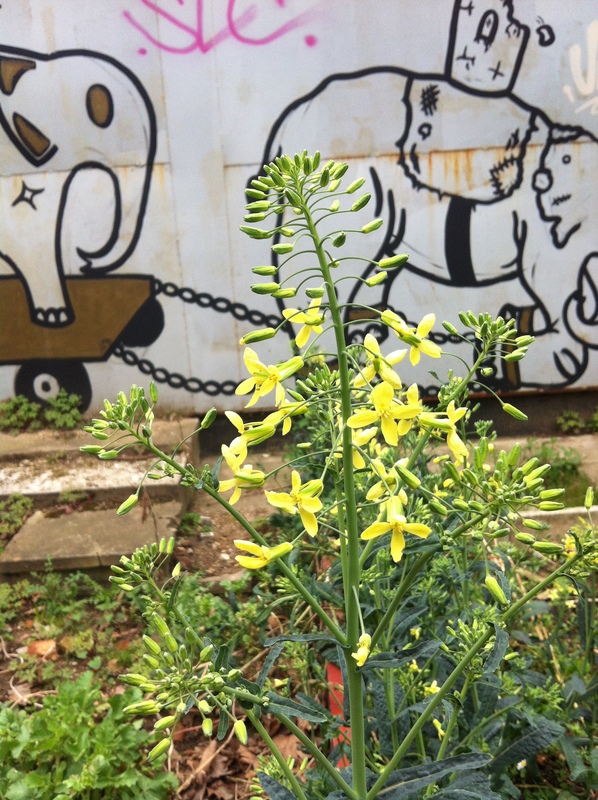 Let’s hope that CAVAT can help the Elephant and Castle Urban Forest. 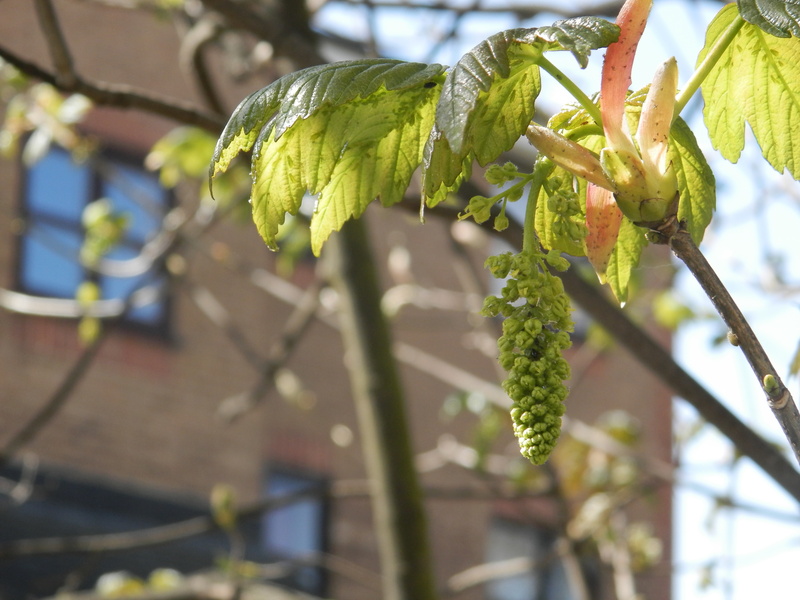 The Council has already acknowledged that its original valuation was wrong, and it seems that the developers are promising to retain more trees under amended plans. Meanwhile, the activists are doing amazing things, including guided walks every Saturday, Bat Walks and other community-based activities. Watch this space and support the campaign here.